For all the changes it has gone through, Guillermo Bert’s painting has consistently displayed two characteristics: a rich, sensuous texture, usually bound up with similarly alluring color, and a restless search for imagery that does not simply incorporate, but embraces, the complexities of modern life. Interestingly, in this ongoing attempt to encompass modern existence, Bert’s work has itself evolved away from visual complexity. He no longer seeks to mirror the cacophony of contemporaneity, but to find something telling, something essential, something nuclear in our latter-day condition. 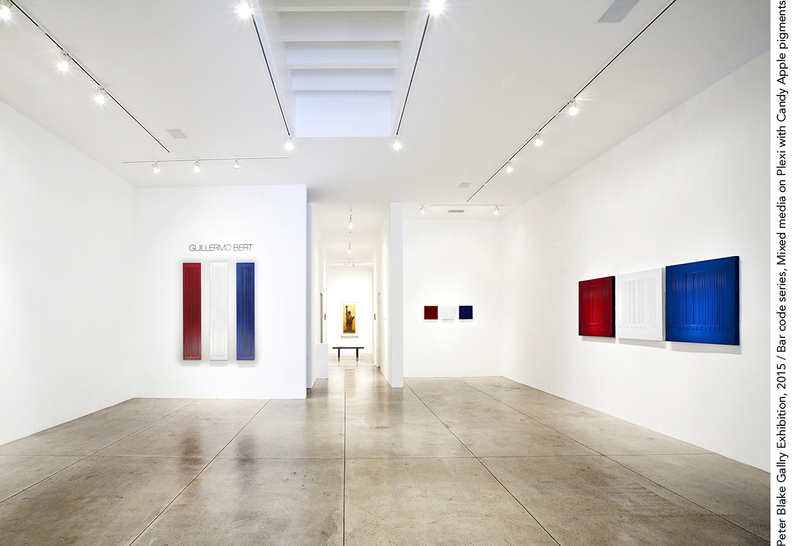 He’s not looking for something that “sums it all up,” but that exemplifies its problems, its dissonances, its seductive and its alienating qualities. presentation, the emblematic display of signifiers – to elaborate upon what constitutes a logical, humorous, and pluperfect distillation of our time: the bar code. 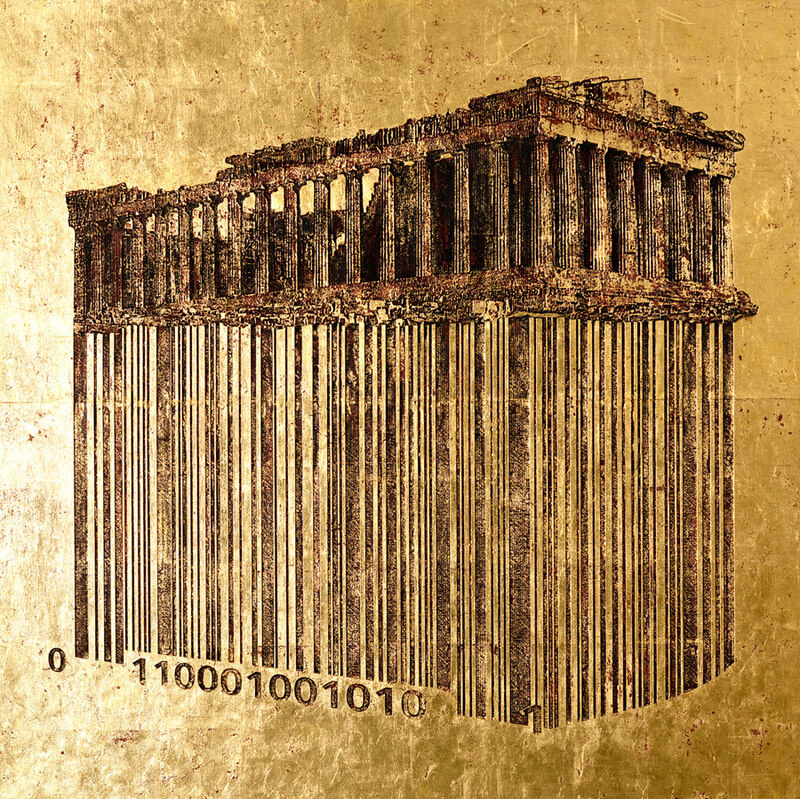 The bar code – itself a harmless, indeed helpful, device –embodies at once the primacy of consumerism, the debasement of ideals, and the integration of digital technology into daily life. The very universality of the Universal Pricing Code gives it currency (as it were) and at the same time makes that currency ominous. It infers that everything has its price – including abstract but profound notions such as citizenship and personal identity. 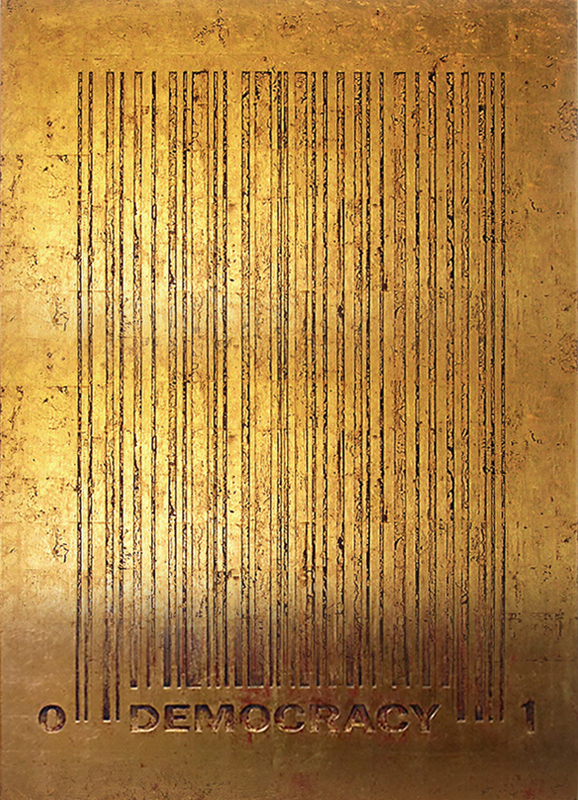 Bert plays upon the bar code’s ubiquity, conflating – or, rather, reducing – political, religious, social, and artistic entities to patterns of elongated vertical bands, patterns the artist incises into almost obscenely rich surfaces such as gold leaf and glossy enamel. Of course, the irony in Bert’s approach is that it turns the immaterial attribution given a material object into a material object itself. 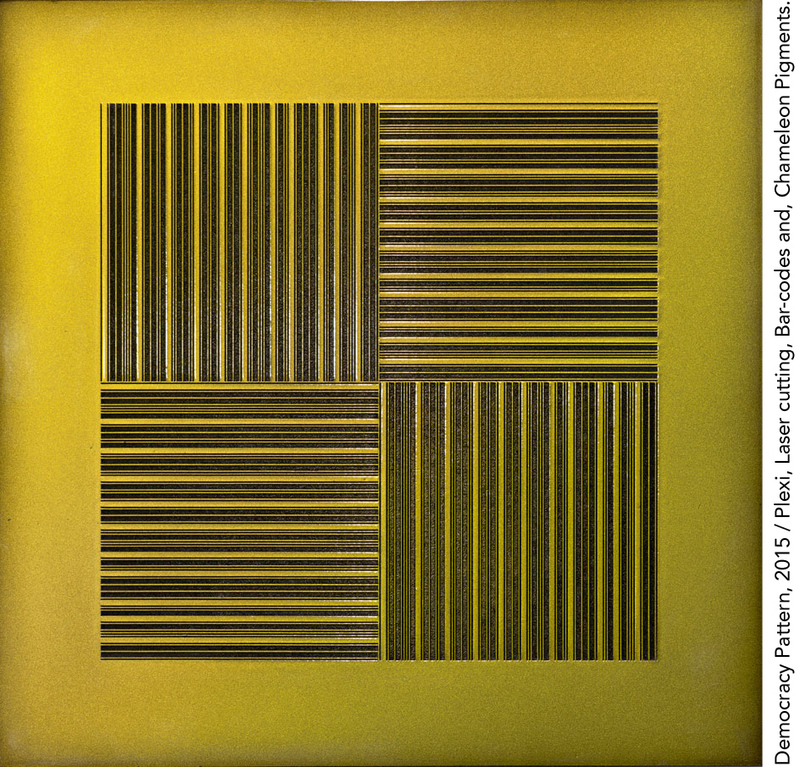 Formerly no more than a disposable notation, printed on labels and read by a crosshatch of red laser pinlights, the bar code in Bert’s art is now palpable, tactile – not quite a “thing” in and of itself, as he has etched its presence into surfaces rather than presented it as bas relief, but still part of an object, an artwork, designed specifically to embody the cascading stripes. 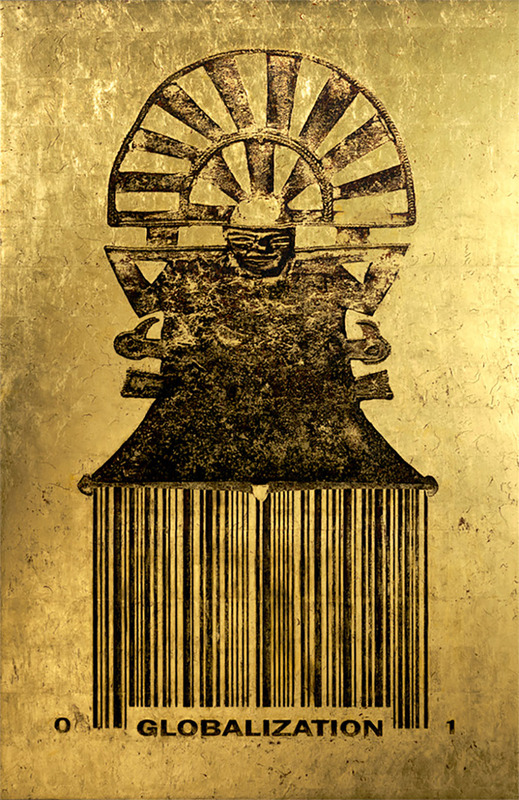 This embodied condition Bert underscores by combining each bar code with the idea or object it identifies – and by inference threatens to replace. 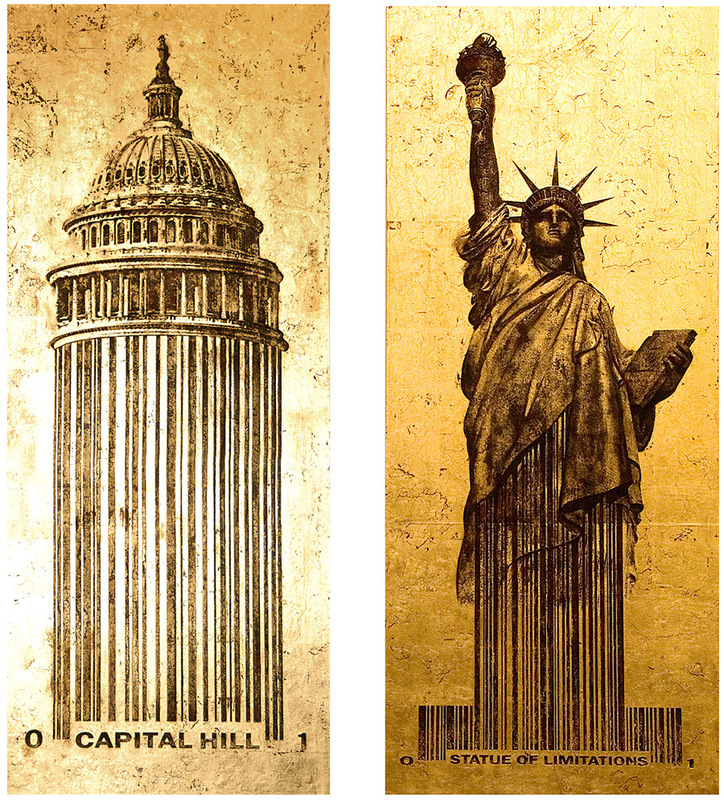 Among recent works, the bar code seems to support, but in fact absorbs, various American government buildings as well as ancient structures that in their classic perfection inhere the supposed fundamentals of our civilization. 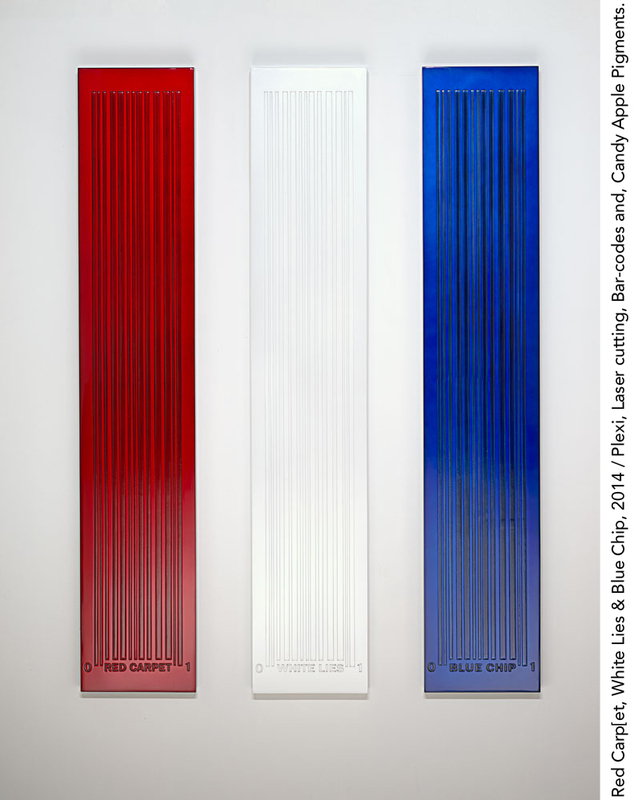 In other painting-reliefs pure concepts (“DEMOCRACY” a particular favorite of Bert’s) translate perniciously into bar codes. Our ideals unite these ideas with those architectural realities – or did, until the rise of the mediated, quantified society of the spectacle (to use Guy Debord’s term) substituted far less noble sinew between idea and reality. The bar code, Bert demonstrates, now functions as veritable scar tissue between what (we think) we believe and the institutions we believe in less and less. of our civilization. 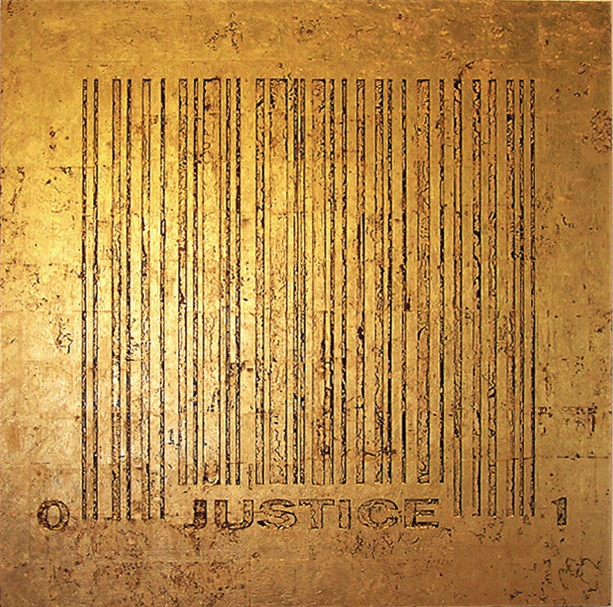 In other painting-reliefs pure concepts (“DEMOCRACY” a particular favorite of Bert’s) translate perniciously into bar codes. Our ideals unite these ideas with those architectural realities – or did, until the rise of the mediated, quantified society of the spectacle (to use Guy Debord’s term) substituted far less noble sinew between idea and reality. The bar code, Bert demonstrates, now functions as veritable scar tissue between what (we think) we believe and the institutions we believe in less and less. notion in pure mathematics, and what could be a profound declaration in Greek could be a joke when “bent” – not translated, but visually interpolated – into English. These visual mind games flicker at the edge of epistemological inquiry, but they finally, and reassuringly, cling to the material world. Their entablature, insisting on their objecthood, does not contradict their exploration of abstract ideation, but it does expose the practical joke Bert has embedded in their seemingly elaborate process of conceptualization. Bert’s wit is clearly more caustic in the Bar Code paintings, uninflected as they are by any elusiveness of meaning. He does not invite us to decode his Bar Codes; he’s in fact decoded them for us by superposing the bars with the things they apparently evaluate or label. There is no real pleasure in this process, much less in the possibility of our translating it; its frisson results from recognition, both of the images in question and of Bert’s satiric purpose. What holds these works together on a plane of discourse higher than mere political commentary is their gaudy beauty and the fact that their collective message – your life and everything in it is quantifiable and even brandable – rings so ready, so powerful, and so true. 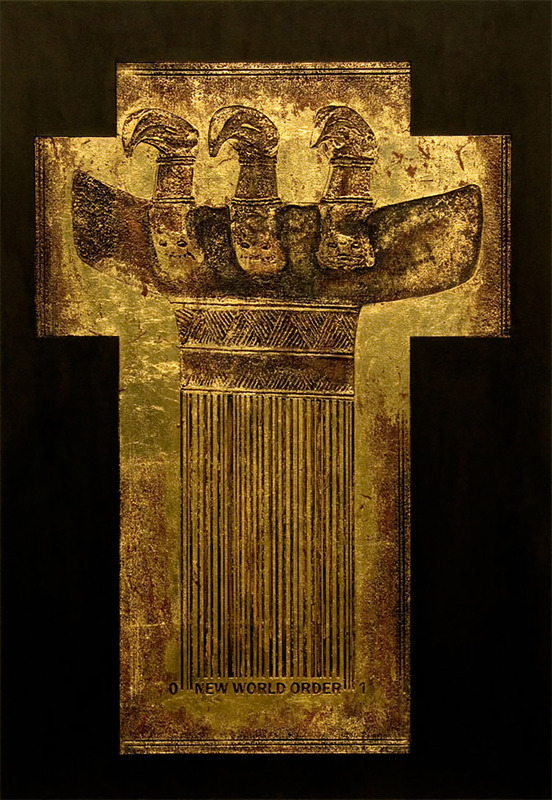 M/M on wood panels with 24 ct gold leaf. Copyright © 2017 Guillermo Bert | All rights reserved.